A HydraFacial is the treatment that the stars get before a red carpet event. Dr. Marie Meyers at Enhance Medical Spa in Cincinnati offers this soothing treatment which will instantly give you a vibrant, glowing face. To learn more about HydraFacials call the office today or schedule your HydraFacial online. The HydraFacial treatment deep cleans, exfoliates dead skin cells, and extracts impurities from your face. It then hydrates the clean skin with a serum containing vital nutrients such as antioxidants, peptides, and hyaluronic acid. 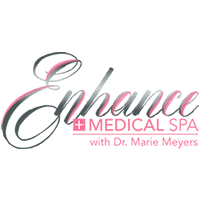 Dr. Meyers and her team at Enhance Medical Spa begin by cleansing the skin and exfoliating dead skin cells. Then a special peel is applied to extract any remaining impurities. Finally a nutrient-infused serum is applied to repair and hydrate the cells. Patients love this treatment, and many return monthly because the results are so amazing. You will notice an immediate lessening of fine lines and wrinkles, and dull skin will once again look glowing and healthy. Book an appointment today and find out what the movie stars already know.